Attorney and Staff | Bowersox Law Firm P.C. Jeffrey Alan Bowersox has been a trial lawyer since 1981. He is admitted to the Oregon State Bar, the United States District Court for the District of Oregon, and the Ninth Circuit Court of Appeals. Jeff is a member of the American Association for Justice ("AAJ"), where he is the a past Chair of the Section on Toxic, Environmental and Pharmaceutical Torts. Jeff is a member of the AAJ "Leaders Forum" and strongly supports the AAJ mission to preserve the right of Trial by Jury for all Americans that are injured by corporate wrong-doing. The courtroom is the only place left in American society where an individual can require a huge corporation to answer for its wrongful acts. Your constitutional right to a Jury Trial holds corporations accountable to the community and the injured person on a one-one basis. Corporations dominate the political election process and can almost control Congress and the White House through major cash contributions to candidates and politicians. In the courtroom, Jeff can fight for you individually and your fellow citizens on the jury can sit in judgment of the actions of any wrong-doer and hold that corporation or person directly accountable in your specific case, right now. This is an amazing power that our Founding Fathers guaranteed to the citizens of America to protect us from the corrupting influence of money and power held by major corporations. The Seventh Amendment to the U.S. Constitution - part of the citizens "Bill of Rights" protects all Americans and guarantees that the right to Trial by Jury cannot be taken from us. Jeff is also a member of the Oregon Trial Lawyers Association ("OTLA"). Jeff served as a member of the OTLA Board of Governors for eight years and also served as Chair of the OTLA Education Committee. Jeff serves on the Executive Committee of the Products Liability Section of the Oregon State Bar ("OSB") and is a past Chair of the OSB Products Liability Section. In the Federal Bar Association ("FBA"), Jeff has serve on the Executive Committee of the Oregon Chapter of the FBA for six years. Jeff is a member of the Multnomah Bar Association, where he serves on the Court Liaison Committee. Jeff is named to the "Top 100 Trial Lawyers" by The National Trial Lawyers Association. Jeff has been elected by his peers in the Oregon legal to community to be a member of "Oregon Super Lawyers" in the areas of Mass Torts/Class Actions in recognition of his well-known expertise in representing multiple hundreds of Oregonians injured by defective medical devices (artificial hips, knees, transvaginal mesh and stress urinary incontinence devices, dialysis machines, pacemakers, defibrillator leads, and other defective devices) and defective prescription drugs including pain relievers, blood thinners, birth control pills and inter-uterine devices ("IUDs") and many other drugs that seriously injured the people who were supposed to be healed or helped by the devices and drugs. Jeff is an invited member of the Melvin M. Belli Society which promotes trial lawyer education and honors a champion of civil justice (attorney Melvin M. Belli). Jeff is also a member of and supporter of the Pound Civil Institute which sponsors gatherings of judges from state and federal courts around the country. The meetings of the Pound Civil Institute provide judges with an opportunity to share scholarly reports on important court-related matters and learn the viewpoints of judges from around the country on topics that are of immediate and long-term interest to judges in the promotion of justice for the people who appear in their courtrooms. Jeff received his Bachelor of Arts degree in History from Albion College in Albion, Michigan, after attending Saint Clair County Community College and the University of Michigan. Jeff received his Doctor of Jurisprudence degree from the Willamette University College of Law in Salem, Oregon in 1981. He began his practice in Bend, Oregon that same year. Since the beginning of his legal career, Jeff has exclusively represented plaintiffs in the areas of personal injury, products liability, brain and spine injury, premises liability, and professional malpractice. Since 1987, Jeff has specialized in mass tort litigation on behalf of plaintiffs. In a complex world, people can be severely injured or killed in the blink of an eye because the at-fault person failed to pay attention. 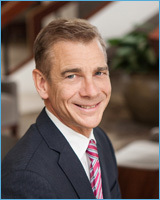 During his thirty-three years of legal practice, Jeff has successfully represented people that were seriously injured in accidents arising from a wide variety of causes, such as defective products of all kinds - including defective medical devices, defective prescription drugs, defective automobiles and machinery - whether the defect caused and injury at home, at work or elsewhere. Jeff has successfully represented people (and the families of people killed) by drunk or careless drivers, trucking collisions, motorcycle accidents, boating accidents, and construction site accidents. The injured people Jeff has represented have sustained many different types of tragic injuries from the defective products and/or careless behavior of corporations and individuals. The injuries from collisions, accidents and defective products include paralysis, brain injury, fractured spines, arms and legs and amputations. The injuries from defective medical devices and defective prescription drugs include heart attack, stroke, blood clots and pulmonary embolism, kidney, liver, lung and other major bodily organ destruction, as well as life threatening infections. As an Oregon defective products lawyer, Jeff Bowersox has represented both individuals and large groups of plaintiffs who have been injured by defective products, dangerous drugs, and faulty medical devices. Jeff has also represented individuals and groups of small-business owners against companies that took unfair advantage of them in business matters. He represented the plaintiffs in the only case in the United States where the federal court awarded $125,000.00 in punitive damages to each of 25 plaintiffs before trial ($3.125 million total). This award was the result of a motion Jeff filed and won against a major oil company. (Bates, et al v. UNOCAL.) The trial court victory by Jeff was upheld on appeal to the 9th Circuit Court of Appeals and the US Supreme Court refused UNOCAL's effort to have the decision overturned. After trial and appeals, Jeff's clients' were paid over $4,000,000 to compensate them for the business and personal losses that sustained as a result of UNOCAL's fraud. Jeff fights hard and wins cases for his clients against national and international corporations and insurance companies on issues as diverse as automobile and truck collisions, wrongful death claims, product manufacturing and design defects, and environmental contamination cases. He has represented plaintiffs in cases against Stryker Orthopedics Corporation, DePuy Orthopedics, Johnson & Johnson, Zimmer Orthopedics, Wright Medical Corporation, Ford Motor Company, Honda Motor Company, Land Rover, BMW, UNOCAL (Union Oil Company of California), Fresenius Dialysis Equipment Corporation, MIKITA North America Corporation, Boston Scientific Corporation, American Medical Systems, Inc., American Medical Concepts, Inc., Sprint Communications, U.S. Bank, West Coast Bank, Resolution Trust Corporation, Pfizer Pharmaceuticals Corporation, Merck Pharmaceuticals Corporation, Medtronic Medical Equipment Corporation, St. Jude Medical Equipment Corporation, Invacare Mobility Systems Corporation, Medical Engineering Corporation, Advanced Neuromodulation Systems, AH Robbins/American Home Products, the State of Oregon, the State of Washington, the United States of America, Allstate Insurance, Progressive Insurance, SAFECO Insurance, GEICO Insurance Corporation, USAA Insurance Corporation, Standard Insurance Corporation, Regence Blue Cross/Blue Shield Insurance Corporation and many other major insurance companies and corporate defendants who injured his clients. Jeff's track record proves that he will not back down from protecting his clients' rights, regardless of the wealth and power of his opponents.